I recently picked up a few bags of crunchy roasted chickpeas at the grocery store, and I discovered a delightful snack! I wondered if I could make them in my own kitchen with canned chickpeas, since the canned variety is much easier for me to find at my local store. Happily the answer is yes! Now they are one of my new favorite summertime snacks, perfect for the beach. They are so simple, but so amazingly crunchy and delicious. 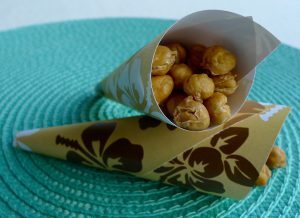 They are easy to pack in your beach bag, or you can dress them up for a summer party with cute paper cones made of scrapbook paper. I have tried several variations of this snack. They are wonderful simply seasoned with salt, but for extra flavor, add a dash of pimentón and cumin with just a hint of cayenne. The sky is the limit on the flavors you can create. Make sure your oven rack is in the middle. Preheat your oven to 350 F.
Drain the chickpeas and rinse well. Then spin them in a salad spinner to get off the excess moisture. Gently roll the chickpeas between two layers of paper towels to make sure they are very dry. In a medium bowl, toss the chickpeas with the oil, salt, and spices (if using), until evenly coated. Spread the chickpeas onto a rimmed baking sheet, making sure they are in a single layer. Bake for 35 minutes, tossing once midway through. Then turn off the oven, but leave the chickpeas in for another hour until they are dry and crunchy.